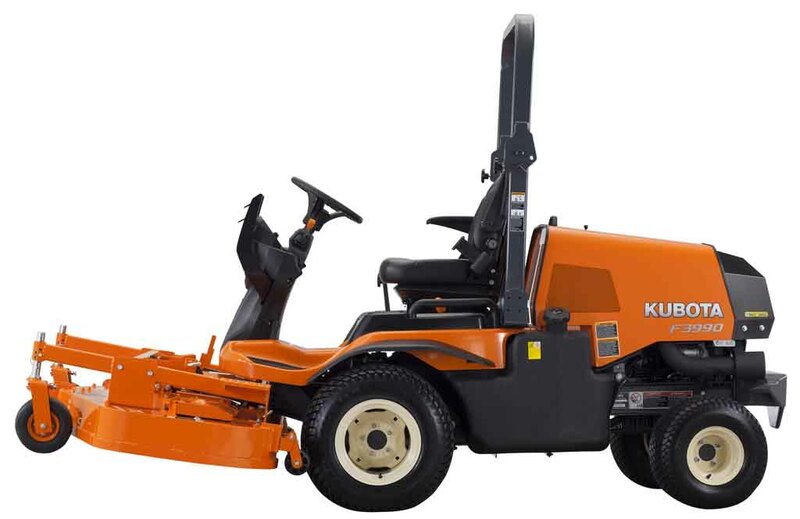 Power, efficiency and productivity combine in Kubota’s F3690 commerical front-mounted mower. 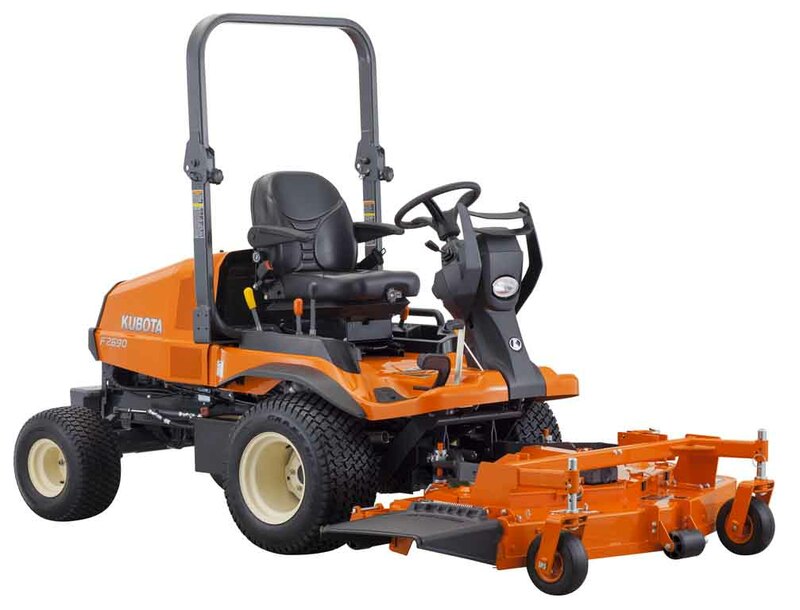 With standard 4WD, Kubota 36HP diesel engine and 60″ or 72″ side or rear discharge pro deck, lets you get the job done faster with an exceptional cut and finish that is sure to impress even the toughest clientele. 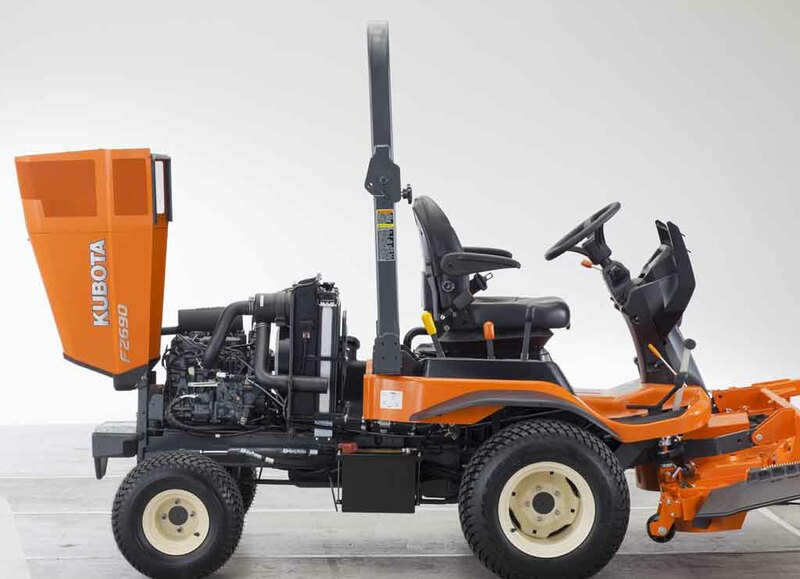 Powered by a Kubota 36HP, 3-cylinder diesel engine, generating a high torque rise, that ensures faster, smoother recovery under sudden loading. 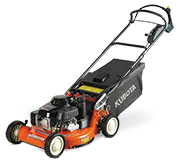 Allowing you to efficiently power through long or wet grass with ease. Large 61L fuel tank keeps you working longer between fuel stops and reduces the number of fuelling stops needed to complete long jobs. That means more time working and less time fuelling up. Auto assist 4WD works in forward and reverse, automatically controlling the drive loads on the wheels during turns. This allows you to turn with greater efficiency and ease with less wear and tear on the turf. Full-time 4WD can also be engaged. 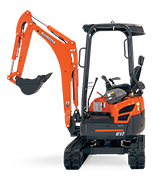 Hydrostatic power steering reduces operator fatigue and makes it easier to mow around trees and other obstacles. 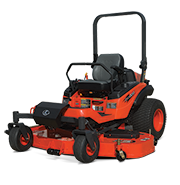 Powerful hydrostatic transmission provides quick response, excellent working speed, and more muscle for tough mowing jobs. The single pedal design lets you easily change the direction as well as control the speed. 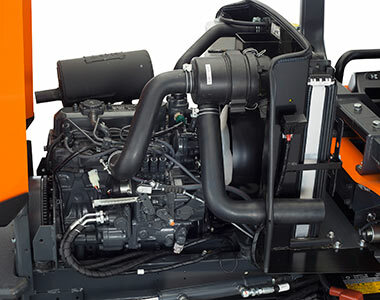 Shaft drive means no belts or pulleys – just smooth and direct power transfer from the engine to the deck. Shaft drive also requires less maintenance and provides greater dependability. 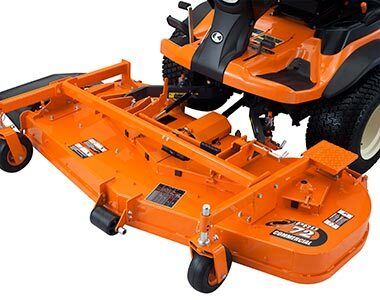 Pro-commercial mower deck with an inner baffle prevents cut grass from discharging to the front. A larger chute improves discharge performance, and also needs less power to run the mower. 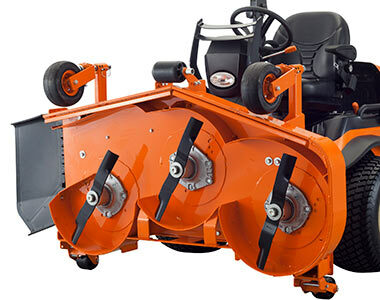 Heavy-duty cast iron pulleys and multi V belt drive system effectively distribute and reduce tension while transmitting power to the mower blades. 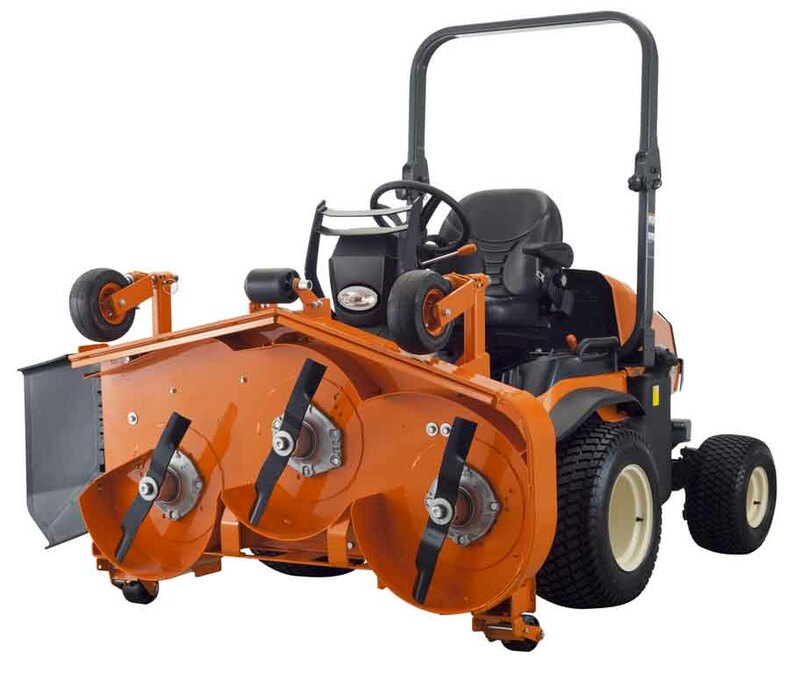 The multi V belt won’t twist or slip, reducing the chance of damage to the mower. Stronger and more durable than conventional pressed steel decks, the F series fabricated steel decks are designed to provide years of reliable cutting performance with minimal maintenance. Large front wheels swivel independently through 360 degrees, ensuring the deck remains above the turf, preventing turf damage. 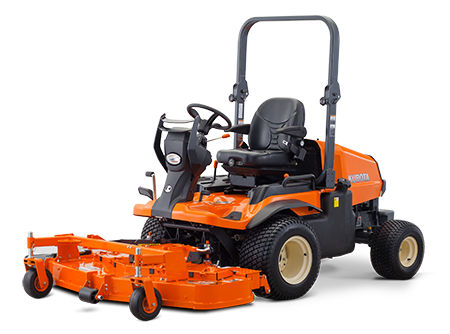 6.0″- deep deck design lets tall grass stand up so that it can be cut more efficiently, resulting in a faster cut and cleaner appearance. Includes deluxe high back seat with four separate adjustments—weight control, lumbar support, back angle, and arm rests—to provide every operator with a custom fit and optimum comfort. Easy to read LCD digital panel provides vital information at a glance, including engine speed, remaining fuel, water temperature and hour meter. Lever guides are designed for quick, at a glace identification. High/low speed lever and deck lifting lever is positioned beside the seat for easy operation. 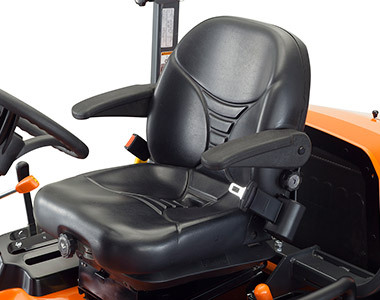 Tilt steering wheel can be quickly adjusted to several positions for optimum operator comfort. Designed for quick and simple maintenance with quick release engine cover. A 90 degree tilt mower deck provides unobstructed access to the blades and deck underside for easy cleaning and maintenance. Dual element air cleaner helps keep the engine running smoothly and efficiently. Air cleaner is equipped with a choke indicator that turns red when the filter needs cleaning or replacement. Easy to clean radiator screen integrated into the engine cover to help keep the engine running cool and efficiently. Water temperature gauge and overheating alarm are provided to help prevent overheating.